Pena, Matt de la. 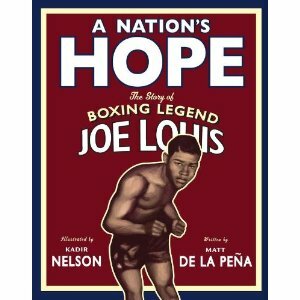 A Nation’s Hope: The Story of Boxing Legend Joe Louis. Illustrated by Kadir Nelson. New York: Dial, 2011. Joe Louis, the Brown Bomber, fought Max Schmeling for the first time in 1936 and was knocked out in the 12th round. It was a humiliating defeat for Louis and strengthened his determination to work harder and fight smarter. Louis was already a favorite of African Americans when he knocked out Jim Braddock to win the heavyweight championship of the world the following year, but it was not until his second match with Schmeling that he became a favorite with all America. For many Americans the bout was much more than a boxing match. It was a symbolic fight between the two nations, a patriotic contest between democracy and fascism. Louis’ first-round knockout lifted the hearts and pride of all Americans and made Louis a national hero. Nelson’s vibrant oil on wood paintings build the tension as the free verse poetry relates Louis’ rise to the top of his sport. The only flaw is de la Pena’s omission of almost all punctuation, leaving readers with no guide to phrasing or pace. This makes the text difficult to read smoothly, sometimes results in awkward phrasing or inappropriate pauses, and makes prereading before sharing aloud an absolute necessity. Nevertheless, from the alliterative imagery in the opening lines, “Yankee Stadium, 1938 / Packed crowd buzzing and bets / bantered back and forth / The Bronx night air thick with summer,” to the victorious closing, “The streets of Harlem once again dancing for their hero / But all of America dancing this time,” the text and illustrations pack a powerful one-two punch that is not easily forgotten.